Resident Evil Licker Plush | Nerd Much? The Umbrella Corporation’s latest terrifying experiment is a fusion of the cute and horrific, and it comes in the form of this Resident Evil 2: Licker Plush. Based on the recently released Resident Evil 2 remake, adapted from the original 1998 Sony PlayStation hit, this officially-licensed Capcom plush has all the quality and terror you would expect from the Resident Evil series, but in a cute, tiny package. Well… maybe cute is relative. You can bring home this little monster for only $25.99. The Lickers are the iconic T-Virus mutant zombies with exposed brains, lack of skin and eyes, and those famous, long tongues. Normally something like that is completely off-putting, but when to adapt it to chibi-proportions ad fill it with stuffing, it becomes something else entirely. The plush itself is fantastic quality. It measures in at 23 centimeters tall. It has distinctive, sewn limbs that hold their shape of the Licker ready to strike, and best of all, the brain has detailed stitching and the tongue is nice and long, just what you want out of a Licker, right? The plush is made from 100% polyester and is super soft and satisfying to squeeze. It’s maybe not that great for kids unless you’re one of the really cool parents. As with any polyester plush, it is best cleaned via spot-cleaning, you don’t want to subject your little Licker to a spin-cycle, do you? 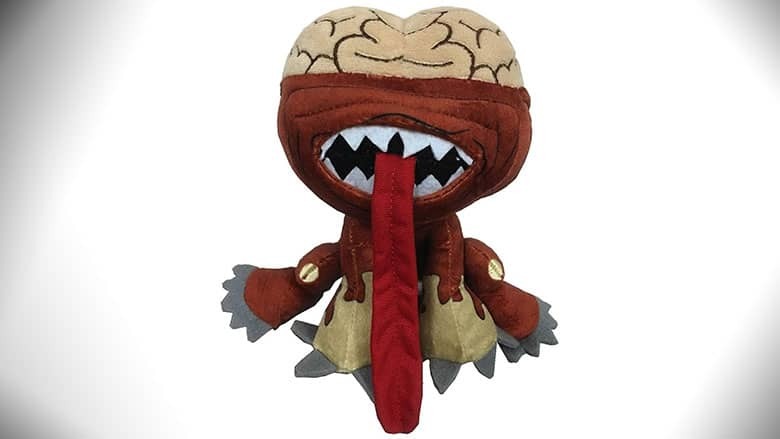 The Resident Evil 2: Licker Plush is currently available for preorder and is set to retail for $25.99. More than likely though, this adorable fellow will probably work his way into your heart… in a non-zombie way, of course! Preorders are tentatively set to ship in June of 2019. So, won’t you bring home one of these little monsters?